Chris Chelios was a skating contradiction. On one hand he was no-nonsense S.O.B but on the other he was a sentimental sap. Chelios has fused these two character traits into a Hall of Fame hockey career. His emotional passion for hockey has created a hockey resume that leaves most jealous: A Stanley Cup championship with Montreal in 1986 and two more in Detroit in 2002 and 2008. Three Norris Trophies, four first-team NHL All-Star selections and eleven appearances in the All-Star game. He was the first American born defenseman to win the Norris Trophy. He became the first blueliner in Hawks history to lead his team in scoring. He also participated in Canada Cups, World Cups and in four Olympics. You get no argument here that he is the greatest American born hockey player ever. It certainly wasn't an easy journey to the NHL for the Chicago-born Chelios. His father came to Chicago from Greece and became somewhat of a rink rat at the old Chicago Stadium. His love for the game was passed on to Chris. Chelios started playing hockey in high school but by the age of 15 his family moved to San Diego. Needless to say there wasn't many hockey opportunities in San Diego. He tried out for the University of San Diego hockey team but didn't make the team! He had all this raw ability but never had any coaching. So Chris left home and ventured to Canada. He eventually wound up in Moose Jaw. Playing under coach Larry Billows, Chelios showed great improvement over 2 years in Moose Jaw. He also caught the eye of the Canadiens, who picked him 40th overall in the 1981 draft. Chelios spent seven seasons with Montreal, learning from the likes of Rick Green, Larry Robinson and Jacques Laperriere. "Those were great years," Chelios says. "I listened and learned a lot." Chelios developed a reputation as a talented and tireless player--logging heavy ice time--but was someone who had a hot temper and often took a stupid penalty. Entering the 1996-97 season, Chelios ranked 32nd all-time with 1,926 penalty minutes. Chelios was traded to the Hawks on June 29, 1990, for Denis Savard, a move that proved mostly unpopular at the time because of Savard's popularity. It was tough for Chelios to accept too. Despite losing their favorite player in Savard, Hawks fans quickly embraced the fiery Chelios and his leadership abilities emerged. Soon enough he was named captain -- an honor he held with Montreal as well -- for the 1995-96 season. Chelios never has taken his NHL job for granted. And he loved to play for Chicago. Before long he sounded totally different than the day he first arrived in Chicago. "Every time I look back and see the position I'm in -- every single game -- I'm just as excited as I was the first game I ever played in," Chelios says. "I'm fortunate to be playing in my hometown and to be playing for the Blackhawks. To me, it's a great honor to play in the NHL and especially for the Blackhawks." 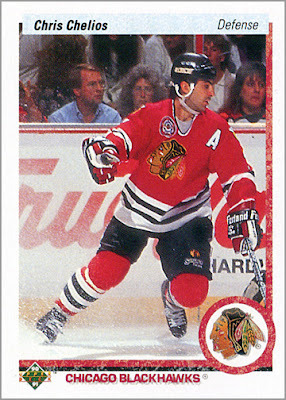 Sadly, the rebuilding Blackhawks traded Chelios on March 23, 1999 to the Detroit Red Wings. Chelios was aging and looking for a contract extension that the Hawks weren't willing to give. "Never in my life did I imagine I would leave the Blackhawks and play for another team," an emotional Chelios said "It's not what I wanted." Chelios in a Red Wings jersey soon did look right. He played in the Motor City for 10 more seasons, winning Stanley Cups in 2002 and 2008. Towards the end of the decade Chelios, an extreme fitness nut, openly mused with the idea of playing into his 50s, bettering Gordie Howe's amazing record of playing until the age of 52. His ice time was severely cut in Detroit, so in 2009-10 he moved on to Atlanta hoping to extend his career. But he could not make the lowly Thrashers team, playing in just 7 games and spending the rest of the season in the minor leagues. It may have been a whimper of an end for one of hockey's greatest warriors. But he played on, for the love of the game. Chelios had an unusual superstition - he had to be the last player to be fully dressed before stepping onto the ice.